Nice work. Would love to get this added into boomerang’s continuity metrics, specifically to enhance our measure of time to visually ready. I wish Long Tasks API had information beyond just script. 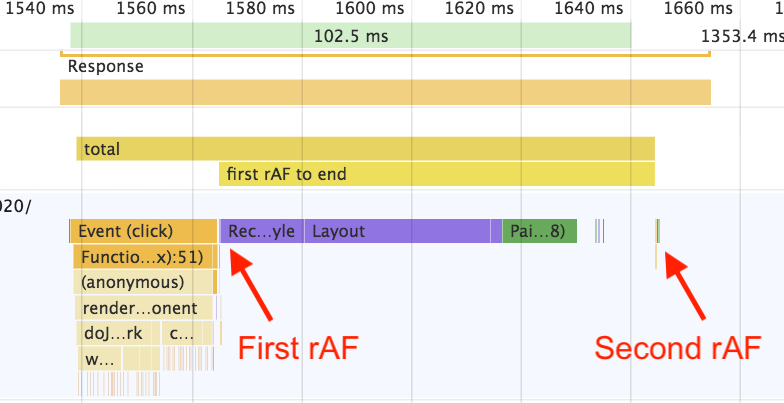 That would be the best way to track this – using instrumentation that is spec’ed and supported by the browser. I love that you’re helping motivate that by giving developers an alternative technique. One downside of deploying this technique in RUM is that (AFAIK) this technique can’t separate JS execution from layout & render, but that might be important for developers to diagnose the problem. Is that true? Thanks for the feedback! Yes, that is a downside of the Long Tasks API (AIUI), and could lead to the “fooling ourselves” example I gave with getBoundingClientRect() (where we only measure JS execution and ignore the style/layout after). Wanted to know your thoughts on setImmediate in this case. How would it compare with rAF + rAF? All other things being equal, though, since setImmediate doesn’t clamp whereas setTimeout does, then yes, using setImmediate || setTimeout inside of rAF does seem reasonable to me. I’d have to test in Edge 18 though, to confirm that it does indeed fire after style/layout. Good suggestion! 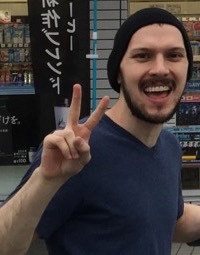 Hey, thanks for the great post ! I wonder if a single setTimeout wouldn’t work here ? A single setTimeout wouldn’t consistently work, because since it’s clamped to 4ms but a frame is typically 16.7ms (or longer, depending on the monitor), it could fire before rAF would. Hence rAF+setTimeout. 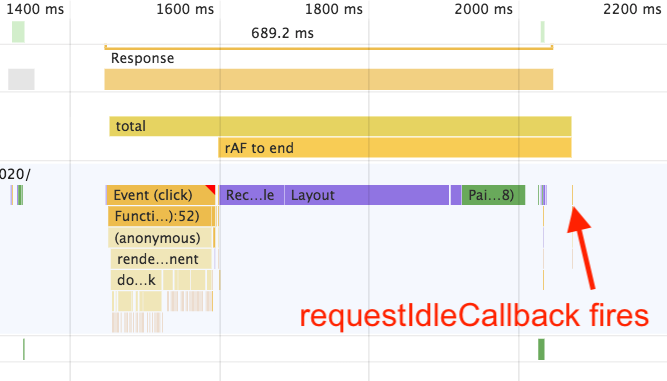 “calling getBoundingClientRect() is slower than not calling it!” did you mean faster? Nope, I meant “slower.” :) The idea is if you only measure explicit JS execution, you’ll measure gBCR but none of the later style/layout costs. So moving costs from the right to the left “looks” slower, even though it’s the same. Thanks for sharing this Nolan. I made sure people on the DevTools team read it. We miss having your expertise in the house but glad you’re still sharing your knowledge publicly! 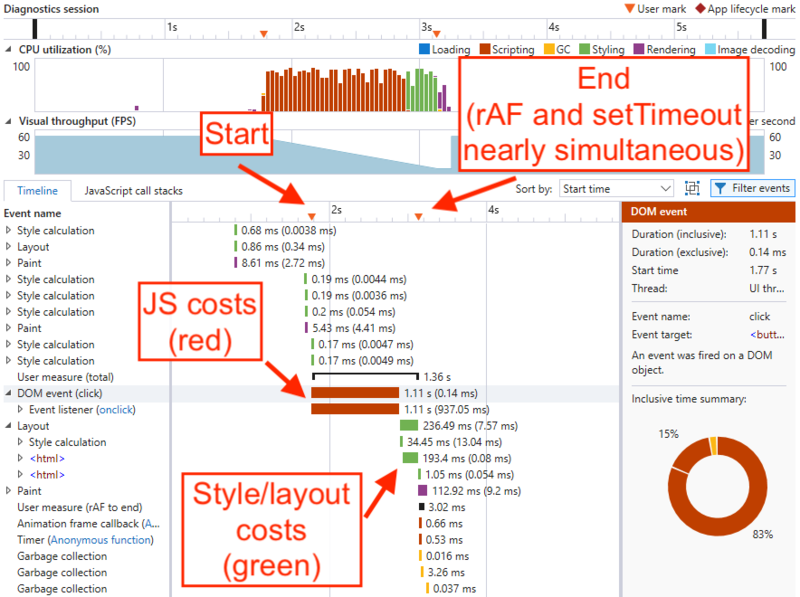 When there are multiple scripts on the page and the first few scripts that are executed does not cause any Reflow and Paint and the next scripts are trying to render something on the page, We will end up measuring the wrong JS execution cost for former scripts since rAF fires later on with the render. We ended up not measuring the execution using rAF since it was inaccurate. Superb reading. Thanks a lot! 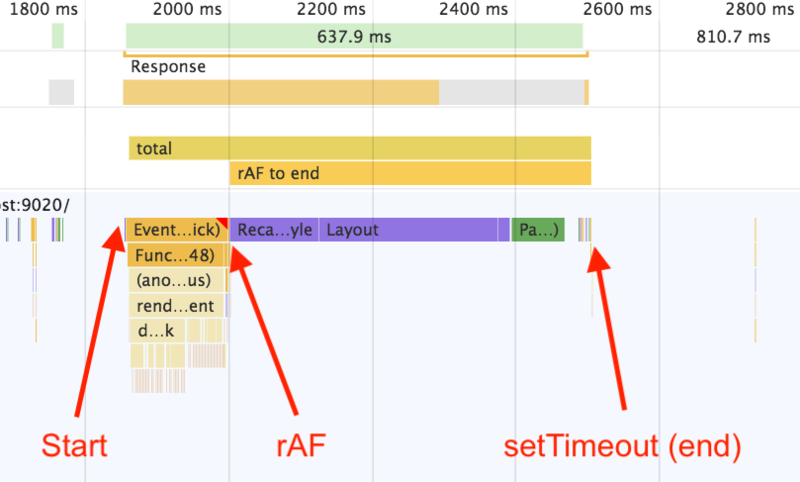 The rAF + setTimeout approach is interesting but wouldn’t the end marker be potentially delayed if there were other macro tasks queued? Great post, Nolan! Did you experiment with something like rAF + postMessage/setImmediate (or some other variant that queues a macrotask)? I’d be curious to know if that solves some of the limitations of setTimeout. Nicely done! :) I think you may have improved on my methods as well, since AFAIK postMessage is not subject to the 4ms throttling. (May be worth verifying cross-browser, though.) Very cool! What did you mean by JS executing but not necessarily compiling? Doesn’t it have to compile successfully first before it executes the code? I just mean that the compilation costs may not necessary be covered in that particular section of the timeline. The compilation could have occurred earlier, or on a previous pageload (and then been cached), etc. Though i feel like its not complete, i mean i would love to see an example on how to catch the specific code that causing slow layout and rendering. 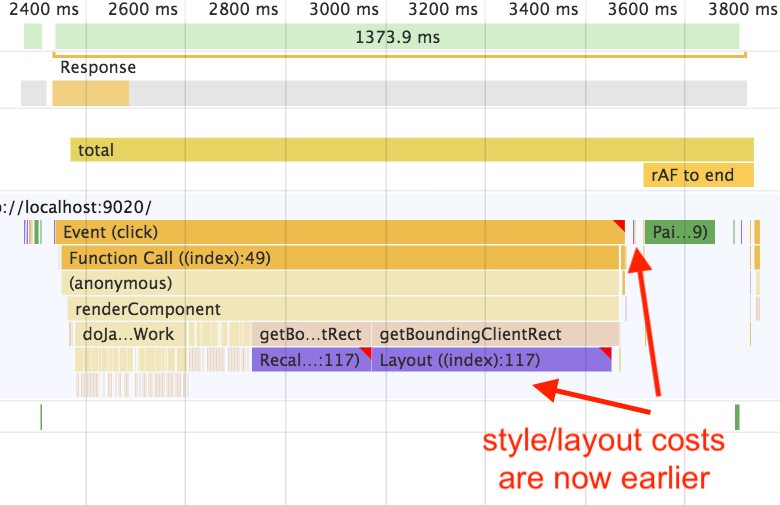 When we call the getBoundingClientRect() repeatedly in JS and making the DOM changes, will only style/layout repeatedly be done or the paint will also be done with style/layout?